Delicious doesn’t even come close. We finished that one off yesterday. 1. Set the oven to 425. 2. Toss the fennel slices with a little olive oil and set them on a rimmed baking sheet. Sprinkle with sea salt and freshly ground black pepper and roast for 30 – 40 minutes until caramelized and cooked through. You may want to turn them after 20 minutes. Set aside. 3. Do not dry the radicchio thoroughly. Toss with 1 tbsp olive oil and sprinkle with sea salt, pepper and the fresh thyme leaves. (Or, as you can see, whole sprigs if you are in a hurry.) After the fennel has been in the oven for 10 minutes add the pan with the radicchio. Turn the radicchio after 15 minutes and continue to roast until tender. The fennel and radicchio should be done at approximately the same time. Remove from the oven and set aside. 4. Set the oven to broil. 5. Toss the asparagus with olive oil and sprinkle with kosher sea salt and freshly ground black pepper. Broil for 4 minutes, turning the asparagus once half way through. 6. Whisk 2 tbsp olive oil, 2 tbsp walnut oil, and 2 tbsp champagne vinegar together until emulsified. Add a pinch of sea salt and several grindings of pepper. 7. Arrange the arugula and lettuce on a large platter. Place the radicchio, fennel, asparagus and chicken over the leaves. Toss the walnuts and goat cheese over the top. Dress. The heat of the oven transforms the floral notes of fennel to caramel. The radicchio loses it’s bitter edge and the flavors turn round, rich and warm. I like the contrasts too. Cool creamy and tangy goat cheese. The bitter crunch of toasted walnuts. Soft green leaves. The slick of walnut oil in the dressing adds another compelling note. I don’t know if the kids would have liked this or not as they didn’t end up getting any. Martin and I ate so quickly. We were starving. It’s not the type of cinnamon roll I usually go for, the very sticky kind with gooey frosting. And there were eight of them, really huge, scented with cardamom from this truly marvelous bakery in Manzanita Oregon. We hadn’t anticipated they’d be so enormous. And the kids, even though they were ravenous from hours of playing on the beach, couldn’t even finish one. Which left me alone in the kitchen with a half finished box of cinnamon rolls. I didn’t eat them all at once and of course I didn’t eat every last one. I’m not that much of a glutton. The kids had made a significant dent. But over the course of a day and a half, the remainder slowly and steadily disappeared. They were fantastic. Which brings me to the topic of today’s post: May will have to be Delicious Detox Month. I was actually going to write about making pizza because I have a new method and I totally love it. However when I discovered there was no wi-fi at the Manzanita cabin my friend Liz and I rented (and really, given my track record of never writing blog posts on vacation, maybe it would never have been written anyway) I ended up waiting another week to write. Then, with the cinnamon roll debacle and feeling rather on the wrong side of forty and clearly not bathing suit ready at all and June being right around the corner, I knew I wouldn’t be writing about pizza. Not this month…It’s time for Delicious Detox. Liz, of course, coined the catchy phrase. As far as the Delicious Detox goes, don’t worry, there is no way I would subsist for a week on honey/cayenne water or what have you. My little brother did that once and from his dizzying experience I know that method is not for people who have to drive carpools or make dinner every night for a bunch of ravenous children. Also, I don’t believe in talking about dieting in front of kids. I talk about making “healthy choices”. Here’s how it will go: I will eat a lot less meat. I will vigilantly search out seasonal vegetables. I will take advantage of halibut and salmon season. I will snack on fruit and drink only water. (I will still have a latte for breakfast though – I’m not completely crazy.) Go sugar free the entire time – no maple syrup, no honey. Only whole grains, if grains are on the menu. Sometimes a little challenge is fun. I promise that whatever I write about will taste delicious – not like compressed hay bales or rabbit food. In anticipation of the new regime, which will start May 1st, I was inspired to make Salade Niçoise. I was hoping to get some sashimi grade ahi to sear as a substitute for the traditional canned tuna. At the seafood counter, the fresh tuna looked grim and the fish guy deeply apologetic. “I was hoping I could just sear it.” I said doubtfully. “Uhhh. It should be alright.” You might describe his look as shifty. I headed over to the canned fish aisle. Line caught tuna, local, packed in olive oil. It is the traditional choice even if it wasn’t what I’d envisioned. 4 boiled eggs: start in cold water and when the water has reached a boil, cook for 5 minutes. Then drain and cool in cold water. Put a medium sized saucepan, half full of water on the stove over high heat. Place asparagus on a rimmed sheet pan with 1 tbsp olive oil and a generous pinch of salt and lots of pepper. Toss until coated. Broil for 3 minutes, turning or shaking the pan once after a minute or two. The asparagus should have some brown spots and smell wonderful. Remove from the hot pan and set aside on a plate to cool. When the water in the saucepan is boiling add 1 tbsp salt and the potatoes. When the water returns to the boil, lower the heat to medium and set a timer for 12 minutes. While the potatoes are cooking, rinse and dry the lettuce and arugula leaves and arrange on a large platter. In a medium bowl, whisk the red vinegar, the mustard, the herbs, 1/2 tsp sea salt and a generous grinding of pepper. Slowly pour in the olive oil in a thin stream, whisking constantly. Drain the tuna and toss with 2 tbsp of vinaigrette. When the potatoes can be easily pierced with a fork, drain them and leave them to cool slightly. When you can handle them without burning yourself, quarter them, and toss them in a small bowl with the vermouth. Add 5 tbsp of vinaigrette to the potatoes. Allow to cool a bit. Toss the cherry tomatoes with 1 tbsp vinaigrette. Toss the rest of the vinaigrette with the salad leaves. Arrange the asparagus over the lettuces. Arrange the potato salad either in a heap in the middle or evenly over the whole platter of leaves. Dot the platter with tomatoes, eggs, tuna and olives. Have I left anything out? David Lebovitz says you choose either tuna OR anchovies. He also said Niçoise salad is perfectly fine with no fish whatsoever. So I didn’t forget anchovies – I just made a choice. So can you. That’s the fun part. The holidays are over. It is raining listlessly. Through the window in my office I can see the looming black shape of the evergreen in the yard, the grey stick mass of the leafless maple tree and the leaden cocoon of the winter sky. In the living room, the Christmas tree is strung with a series of dusty, white, spider webs connecting the Santa Claus at the top to the light on the ceiling. Tree limbs droop with the weight of the ornaments and there are more and more needles on the carpet. (I’m taking the tree down tomorrow, I swear!) Outside, it is not particularly cold and certainly not warm, but it is soggy. Thick new moss grows on everything, greenly blanketing paths and the steps – even tree branches. What an excellent time of year to play around in the kitchen! It was about this time last year that I wrote about grapefruit in salad. The winter weather must drive me to anything at all reminiscent of sunlight. Anyway, I made this salad over the holidays again and again and sent the recipe around to anyone who asked for it. (It’s a reworked and vastly improved version of the failed salad) I must have eaten it twenty times in the last month and I’m still not sick of it! The candied walnuts were very last minute. There were none left at the grocery store (probably because I started a run on them!) so I had to find a recipe. I made the walnuts for the first time this Christmas Eve. Crisp, spicy and so one-more-handful-ish, I made a batch minutes before leaving for my aunt’s house: a sweet little extra Christmas gift. How perfectly handy – to have a recipe like that. Combine 1 tbsp hot water and red vinegar in a very small bowl with 1 tbsp currants. In another very small bowl, toss champagne vinegar with the sliced shallot. Wash and dry the leaves of watercress and mound on a large platter. Cut the Blue Castello into small pieces, removing any rind, and strew over leaves. With a very sharp knife cut the top and bottom off the grapefruit. Cut off all the rind and pith. Over a medium sized bowl, carefully slice between the membranes to remove the fruit in sections, catching any juice and the fruit in the bowl. Arrange the sectioned grapefruit over the salad. Toss the walnuts over the top. Lift the shallots out of the vinegar carefully, reserving the vinegar for the dressing. Pulling the rings apart, scatter the shallots over the salad. Drain the currants, and toss over the salad. Add 1-2 tbsp grapefruit juice to the small bowl with the champagne vinegar. Whisk in olive oil, 1/2 tsp sea salt, and a few grindings black pepper. Dress the salad – you may not need all the dressing. Toss all ingredients together in a medium sized bowl. Lightly spray a rimmed cookie sheet with vegetable oil. Spread the coated nuts over the cookie sheet. Toast for 15 minutes, stirring every 5 minutes. Remove from oven and cool stirring every few minutes so they don’t stick too badly to the pan. You might think you’re mad at me when you see how the maple syrup and sugar seem welded to the cookie sheet. Don’t worry. Pour a cup or two of very hot or boiling water over it and in a few minutes it will wash right off. I really hate to write about food that requires any sort of special equipment to be successful. I haven’t written up my favorite honey-saffron ice cream recipe or about the crazy pasta shapes I love or anything that might require a tool that falls into the realm of food geekiness. (That would include, for example, my ice cream maker and the pasta attachment on the KitchenAid.) A mandoline slicer falls into a category of esoteric kitchen equipment that most people don’t have much use for. Few people feel they need to julienne or shave things wafer-thin. So initially I was a little reluctant to write about this fennel salad. But here is fall, misty and damp. Leaves are on the brink of yellow. The air is beginning to cool and local apples are appearing in the market, crisp and sweet-tart. Rubenesque end-of-summer heirloom tomatoes are a thing of the past. (I was getting a little sick of them anyway!) Now we’ll have a heap of paper thin fennel threaded with slivers of apple, shavings of sharp cheese and studded with toasted hazelnuts, all dressed tartly in cider vinaigrette. If you are serving the salad with something beige or brown like roast chicken, you may want to add a handful or two of arugula which looks gorgeous and is also intriguingly bitter against the floral fennel and the sweet apple. This is a salad for fall. If you don’t have a mandoline, you’d better sharpen your best chef’s knife, take a deep breath and get ready to slice. Toss all ingredients together with your hands on a large white platter. Whisk all ingredients together with a fork until emulsified. Drizzle over salad and gently toss. If you are interested in owning a mandoline slicer, I have heard that this Japanese version is very good and a great buy. There is something very satisfying about slicing so precisely and efficiently, but that just might be a combination of the food geek and architect in me. As if they weren’t already wonderful enough roasted and tossed into a salad! Those little beets you get in the summertime, red or chioggia, don’t need any cooking at all. All you have to do is peel them and grate them on a box grater. 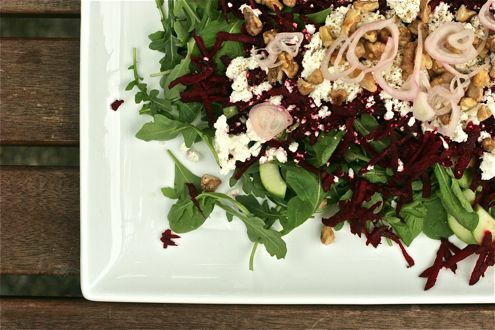 2 small beets for 1 big salad – I use arugula or little gem for greens, cucumber, shallots, goat cheese, toasted walnuts. You can see how I made the first beet salad here. Just substitute grated raw beets for the cooked. Now that’s fast. While the beets are cooking, put the shallot slices into a small bowl with the champagne vinegar. Manipulate the slices with your fingers to separate the rings and to make sure that they become saturated with vinegar. When the beets are done, you’ll be able to push a fork into them. Don’t wait until they’re mushy and don’t take them out when they’re still crunchy. If you cook them early in the day they can sit on the counter until you are ready to peel them, slice them and put them in the salad. A cooked beet should NEVER see the inside of the fridge. They become horribly watery and mushy. Add 4 tbsp olive oil to the bowl with vinegar and shallots. Whisk with a fork and taste – it should be nicely balanced without aggressive acidity. Add 1/4 tsp sea salt and taste again. You may like up to 2 more tbsp of olive oil. Add freshly ground black pepper to taste. Peel the beets and slice them into 1/8ths. On a large platter, arrange a bed of arugula. Scatter the cucumbers and beets over the greens. Then crumble the chèvre over everything. Toss the pine nuts evenly over the top and finally dress lightly, you may not have to use all the dressing. Be sure to fish out all the shallots and include them – they add so much flavor and delicate color! So of course I had to make it again the next day! I have been having an incredibly good time in my kitchen this week, inspired by the first sunny and (slightly) warm weather we have had here in Seattle since…September? Seattle is blooming and everything that has been brown and wet for so long is now green. (And wet. Sigh.) Still, the green is a huge improvement. Now I want to make green food. My friend Christine thoughtfully brought over an Alsatian Riesling to drink with it and it was perfect, more so because I got to share it with a really good friend. As soon as I have a chance to make the halibut again, I’ll take pictures and post the method. I want to show you how to make aioli. Any dish that tastes good with capers in it tastes even better with capers not in it. I agree 100% and I feel validated in my opinion because Nora Ephron said it first. Anyway, the dressing. I made it for this cabbage and arugula slaw that I was sure would be wonderful (it wasn’t) but the dressing had potential. (without the capers!) Garlic, salt, fennel seed and black peppercorns are mashed together with a mortar and pestle and then left to macerate with olive oil, shallots and lemon rind. It’s complex. Fire from the garlic and peppercorns, high spring notes of fennel and lemon and the edge-y richness of sliced shallots and champagne vinegar. Without the capers, it’s pretty fantastic. This is an extremely green, salad tour de force. I think after this cold and gloomy winter what I needed was a giant hit of chlorophyll. Preheat the broiler – set it to high. In the mortar and pestle, mash the garlic, sea salt, fennel seeds, peppercorns, tarragon and 2 tbsp of the minced parsley until you have a smooth paste. Stir in the lemon zest, shallots, the rest of the parsley and olive oil and leave to macerate for 1/2 an hour. While the salad dressing is resting, arrange the arugula on a large platter. Then toss the asparagus with 2 tbsp olive, 1/2 tsp sea salt and several grindings of black pepper on a rimmed sheet pan. It should be in one layer. Broil 4 inches from the heat until bubbling; toasted but still crisp/tender. My asparagus was just under 1/2″ in diameter and this took about 2 minutes per side – a total of 4 minutes. Remove the asparagus from the pan and arrange while still hot, over the arugula. Strew the crumbled goat cheese and pine nuts over everything. Add the champagne vinegar to the dressing and taste. Does it need more salt? Ladle the dressing over the salad – depending on how much asparagus and arugula you have, you may not need all of it. It could have been a lot prettier but seriously, it was totally delicious. Slice the shallot with a sharp knife, into thin circles. Toss them in a small bowl with the vinegar. Leave for 5 minutes or so. With the same sharp knife, carefully cut away the peel of the oranges, leaving almost no pith. Slice the fruit of the orange out, cutting on either side of each segment. You will be left with only the tender fruit. Pour the vinegar from the shallots into a jar with a lid or another small bowl and add the olive oil to taste. I add more oil if I use grapefruit, less with oranges. Add the salt and pepper to taste. I would start with 1/4 tsp of salt, whisk it all up and see if you like it by dipping an arugula leaf into it and tasting. Toss the arugula with the orange or grapefruit sections and the shallots. Add some of the dressing, you may not need all of it. Don’t make a limp overdressed salad. That is not the point! Use a light hand. If you have leftover dressing it will keep in the fridge for when you make the salad tomorrow night! Since I have eaten this salad so many times in the last few weeks, I am looking to shake things up. Tomorrow I will try 2 tbsp of toasted walnuts and an ounce of crumbled soft goat cheese or mild blue cheese. I know it will be very good. Sometimes, you have to go off road to get exactly what you want. It’s funny; when I got the idea that I wanted a shrimp and avocado and either grapefruit or mango salad for dinner, I thought there would be at least half a dozen recipes at my fingertips in my stacks of cookbooks. Nope. Not one. I tried all the usual suspects: Weber’s Big Book of Grilling , Forever Summer (Nigella Lawson), various titles from the Barefoot Contessa (although I never, ever find anything I want to eat in her books – pretty pictures though). I even checked Shirley Corriher’s Cookwise – I always wish I could find something there because it’s so well researched, and invariably I have to look elsewhere. I was pretty happy. No. Better than that. Very happy. We all were. No complaints today. In retrospect, the only thing I might have added were either some toasted pine nuts or frizzled shallots. Start the coals or heat up a gas grill. In a medium sized bowl, whisk the lime juice, cilantro, chili flakes, salt and pepper together. Add shrimp to bowl and toss. Set aside to marinate as you prepare the red onion, salad dressing and mango. Rinse the onion slices in several changes of water. In a small bowl, toss them with 1/4 cup lemon juice, 1/4 c water and 1/4 tsp each salt and pepper. Set aside. In small bowl, whisk 1/2 c olive oil, 2 tbsp lemon juice and 1/4 tsp each salt and pepper. Set aside. Peel and cut mangos into 1/4″ slices. Peel and cut avocados into 1/4″ slices. Squeeze the 1/2 lemon over the slices to prevent browning. Grill the shrimp skewers over direct medium heat for 3 minutes per side. Toss the romaine with half the olive oil vinaigrette. Arrange the mangos and the avocados over the romaine. Drain the onion slices and strew over the salad. Drizzle the remaining vinaigrette over everything. Arrange the shrimp skewers on top. *Since we have a possible shrimp allergy with one of the kids, I grilled a chicken breast with the shrimp. The salad can be served with either chicken or fish or on its own. If you were going to parse the series of menus in my blog, I really have to wonder what you would think as you were reading – something like: there’s this lady who has a blog and all she does is write about Indian food and sausages – weird! All I can say in my defense is that my mom is English and the English have a thing about curries and bangers, although not usually on the same menu. Kashmiri koftas are kind of like a curried banger – or at least a curried sausage and that is what I made for dinner tonight. Lamb, ginger and other Indian spices are browned then braised with yogurt, cardamom, cinnamon and bay. As I was cooking, I lifted the lid over the simmering pan and just closed my eyes and inhaled. The word that came to mind was “heady”. Heady with subcontinental spices. I was transported. And after a week of school auctions, procurements, meetings and the like (I won’t bore you with the details), that is just what I needed – to be somewhere else. Preferably somewhere sub-tropically hot, where the food is really, really good. Cooking another culture is my escape – a cheap trip out of here. Most of today’s menu came from Madhur Jaffrey’s Indian Cookery and if you don’t have this book already, I have to recommend you run out and get yourself the updated version, Indian Cooking , and cook your way through. One year I gave Indian Cookery to every member of my family (I guess I can be a bit of a zealot). I think my brother Jonny uses it occasionally. But it pays to be fearless if you have to cook all the time. You see, when I make dinner from Indian Cookery, I am never bored. I never feel as if I am stuck in a terrible complacent rut where the kids dictate our every bite. So many parents cower before their children, who act like little dictators, falling apart if the food isn’t blandly familiar. I would be really sad not to eat with my kids, exposing them to all the things I love (there are so many things! ), teaching them the pleasures of tasting and eating together. The kids gobbled dinner tonight – they were really talking to me and to each other about what made it taste so good. I bet we’ll arm wrestle for the leftovers tomorrow. Please, don’t be put off by all the spices. Go to the bulk section of a reputable grocer and buy 3 tbsp of each one – labeling them carefully. (if you forgot to do that – it would be so terrible and confusing!) Even though the list of spices is long, all it takes is a little measuring. Don’t buy the glass jars – you’ll spend an arm and a leg. Read over all four recipes first, then measure out the spices for all the recipes at once. I have a bunch of odd little bowls for this purpose. Combine the measured spices, as the recipe states, into the bowls so you can add them in groups as required. The rest is incredibly easy. There are ground roasted cumin seeds in both the aloo gobi and the raita – roast all the cumin seeds at the same time. Take the seeds and put them in a heavy bottomed small pan over medium heat. Push around with a wooden spoon until fragrant. Don’t ignore them, they’ll burn in a matter of seconds. The whole toasting process should take about 2 minutes. Grinding in a mortar and pestle – about 15 seconds. Build the roasting and grinding into the measuring process, before you start the actual recipes. Roasted cumin seeds are very easy to grind with a mortar and pestle. My nine year old did it for me. I also have a coffee grinder reserved for grinding spices. Use a Microplane grater to grate the ginger. Cut up the cauliflower and start it soaking before you start. Steam the potatoes while the Koftas are simmering. Combine all the ingredients for the koftas in a medium sized bowl, and mix well using your hands. Wet your hands with water and form 24 koftas, in sausage shapes,about 2 1/2-3″ long and 1″ thick. Heat the vegetable oil in a large non-stick frying pan over medium high heat. When hot, put in the cinnamon stick, cardamom pods, bay leaves and whole cloves. Stir to coat with oil. Add all the koftas in a single layer to the pan and fry until they are lightly browned on all sides – about 2 minutes a side. While they are browning, stir the yogurt into the warm water. Pour over the koftas and bring to a simmer. The liquid will look very watery – that is intentional. Simmer for 1/2 an hour, turning the koftas every 10 minutes. At the end of 1/2 an hour, the liquid should have boiled away, leaving only the vegetable oil. If you need to, turn up the heat to reduce the liquid. With a slotted spoon, lift the koftas out of the pan to a platter or plates. Leave behind any leftover liquid and spices. Aloo gobi is one of my all time favorite foods and so I have to put it in my blog. I can’t apologize for all the ways that cumin appears: whole, ground and roasted and ground. I know it seems like a lot of work especially if you’ve never roasted and ground spices before. Just try it. Trust me. Do once or twice and you’ll see how easy it is. Steam the potatoes if you have fingerlings. Cut small potatoes in half or cube leftover potatoes into 3/4″ cubes. You needn’t peel fingerlings – their skins are so thin. Soak cauliflower in a bowl of cold water for 1/2 an hour. Drain. Heat the oil in a large non-stick pan over medium heat. When hot, add the whole cumin seeds and let sizzle for a few seconds. Add the cauliflower and stir for 2 minutes. Let the cauliflower get little brown caramelized spots on it. Cover and simmer for 4-6 minutes or until the cauliflower is almost done – with the merest crispness left in it. Add all the ingredients in the bowl and the potatoes to the skillet and stir gently and thoroughly for 3 or 4 minutes until potatoes are warmed through. Mix all ingredients and refrigerate covered, until ready to eat. This is so NOT an authentic recipe. I found it in the back of Gourmet in 1994. Perhaps you will find it too sweet. I love it on butter lettuce with cucumbers and avocados. In a blender mix the first 5 ingredients. Slowly, in a thin steady stream, add the vegetable oil.